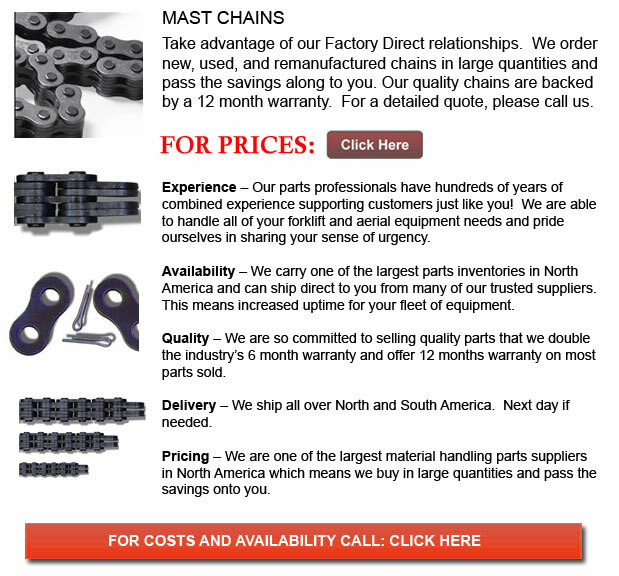 Mast Chains - Leaf Chains comprise various functions and are regulated by ANSI. They are designed for low-speed pulling, for tension linkage and forklift masts, and as balancers between head and counterweight in certain machine devices. Leaf chains are at times even called Balance Chains. Made of a simple pin construction and link plate, steel leaf chains is identified by a number which refers to the lacing of the links and the pitch. The chains have certain features like high tensile strength for every section area, that allows the design of smaller mechanisms. There are B- and A+ type chains in this particular series and both the AL6 and BL6 Series have the same pitch as RS60. Lastly, these chains cannot be driven using sprockets. Comparably, in roller chains, all of the link plates maintain higher fatigue resistance because of the compressive stress of press fits, while in leaf chains, just two outer plates are press fit. The tensile strength of leaf chains is high and the maximum allowable tension is low. When handling leaf chains it is essential to confer with the manufacturer's instruction manual so as to ensure the safety factor is outlined and utilize safety measures always. It is a great idea to apply utmost caution and utilize extra safety measures in applications wherein the consequences of chain failure are severe. Higher tensile strength is a direct correlation to the utilization of a lot more plates. Because the utilization of much more plates does not enhance the most acceptable tension directly, the number of plates may be restricted. The chains need regular lubrication in view of the fact that the pins link directly on the plates, generating an extremely high bearing pressure. Using a SAE 30 or 40 machine oil is often suggested for the majority of applications. If the chain is cycled over one thousand times day by day or if the chain speed is more than 30m for each minute, it will wear extremely rapidly, even with constant lubrication. Thus, in either of these situations using RS Roller Chains will be more suitable. AL type chains are only to be utilized under particular situations such as where there are no shock loads or if wear is not a huge problem. Make positive that the number of cycles does not exceed 100 daily. The BL-type would be better suited under various conditions. The stress load in components would become higher if a chain with a lower safety factor is selected. If the chain is even utilized amongst corrosive conditions, it can easily fatigue and break extremely quick. Performing frequent maintenance is vital when operating under these types of conditions. The inner link or outer link kind of end link on the chain will determine the shape of the clevis. Clevis connectors or Clevis pins are constructed by manufacturers, but the user typically supplies the clevis. An improperly constructed clevis can reduce the working life of the chain. The strands must be finished to length by the manufacturer. Refer to the ANSI standard or phone the maker.